Now, I don’t actually own a Mac, but there’s no such thing as “Sad HP G42” so for theatrical purposes, I’m using this pic. I am so SORRY FabNerds! It’s been almost two weeks since my last post. Since the implementation of the Nerdy and Fabulous Mission Statement, this is the longest I have gone without posting. FabNerds, you all know by now that nothing good happens when I start talking to myself in italics. Two days turned into a week and in the days that follow calamity ensued.You probably saw if you follow me on Twitter*, but in case you missed it you can read the whole thing here. This also means that I have to go to the library when I need a computer. And since I’m in the midst of End of Semester Craziness when I’m at the library, I really need to be doing school work and not blogging about hats, Ben Affleck, OR The Feminine Mystique. However, I am fortunate enough that I have wonderful parents who are currently sending me a Backup Laptop. So, in a few days, I will be using that and blogging my little heart out! And don’t worry, I haven’t forgotten that I owe you March’s Monthly Obsession. Plus, I’ve got some other cool things in the works. Hey FabNerds! Sorry, it took me centuries (hours) to post. I also need to apologize in advance for the lameness of this Friday update. As some of you know, the Eastern US was it today by a crazy snow storm call Nemo (seriously) and because of that all classes and event s on campus were cancelled. AND our Starbucks closed early*! Because of this. I am writing off today as a Stay-cation and I really don’t feel like writing today. I feel like eating Nutella and watching Casablanca with my roommate (which is what we will be doing as soon as I finish this). So, there’s not going to be a really post today. I know. Super lame, right? Don’t worry FabNerds, I’ll make it up to you soon. Just not when there’s a Nor’Easter a foot. Thanks for understanding. 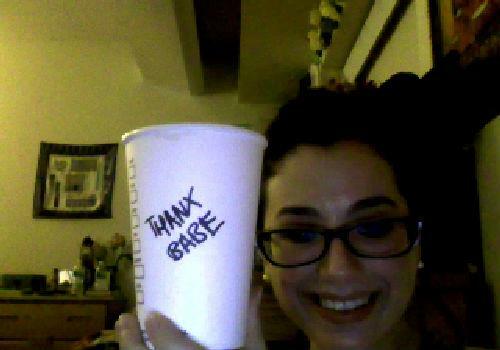 Me with the last Starbucks on campus, Thanking YOU!